In 1937, “Life” magazine called her “probably the most powerful woman in the world.” In 1976, however, Madame Chiang Kai-shek was a grateful patient who thanked her physician with a unique gift: a limited-edition book featuring lithographs of landscapes she had painted. The volume is now a part of the Rare Book Collection at Hope, given in turn to the college by that physician—Dr. George Zuidema—and his wife Joan for others to enjoy and study. Published in 1962 as a private limited edition, the book contains 24 color landscapes reproduced from the original artwork, along with a foreword from Madame Chiang’s husband regarding her paintings. It is being featured until Friday, Feb. 24, on the main floor of the Van Wylen Library, part of an on-going series of displays featuring significant materials from the college’s collection. 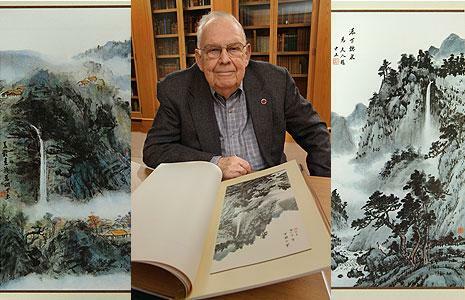 “The paintings depict the serenity of nature and Chinese culture, an interesting contrast to the tumultuous life of Madame Chiang,” said Kelly Jacobsma, who is the Genevra Thome Begg Director of Libraries and an associate professor at Hope. Jacobsma noted that Madame Chiang, who died in 2003 at age 105, took up painting relatively late in life, in around 1953. She first exhibited her paintings in January 2000 at the World Journal Art Gallery in New York and in February 2000 at San Francisco’s Asian Art Museum. Born Mayling Soong, Madame Chiang was raised as a Christian and graduated from Wellesley College in 1917. She and her husband were married from 1927 until his death in 1975. Chiang Ka-shek led China from the latter 1920s until the communists took control in 1949, subsequently leading Taiwan. As one reflection of her prominence, Madame Chiang was on the cover of “Time” magazine three times, in 1931, 1938 and 1943. Following her husband’s death, she immigrated to her family’s estate on Long Island in New York. It was while living in the U.S. that she came under the care of Dr. Zuidema, a 1949 Hope graduate who was serving as professor and director of the Department of Surgery at the Johns Hopkins Hospital and Medical School in Baltimore, Md. While the hospital was accustomed to serving prominent patients, Madame Chiang was at an entirely different level. While the security and support arrangements were extensive, he found his patient personable and gracious. “She had a lot of staff and people looking after her, but she didn’t seem to have an attitude about it,” he said. Dr. Zuidema had nearly had an opportunity to treat her in the early 1960s, when he was on the faculty at the University of Michigan medical school and she and her husband were still in Taiwan, but the visit didn’t materialize. “I have no idea how they got my name in the first place, because I was just on the regular surgical faculty at Michigan,” he said. The book that she gave him at the conclusion of her 1976 hospital stay became a treasured family keepsake for nearly 35 years. This past summer, though, the Zuidemas decided that it was time for it to have a new home, particularly in light of the new art museum that the college will construct as part of the A Greater Hope comprehensive campaign. From Johns Hopkins, Dr. Zuidema returned to the University of Michigan, where he served as vice provost for medical affairs and professor of surgery until retiring in 1995. He and Joan now live just a few blocks from Hope. Dr. Zuidema has remained engaged with the college across his years as an alumnus, further inspiring their decision to give the book to Hope. He’s been serving on the Board of Trustees since 1988.